At a time when some divisions in our world might seem insurmountable, our El Salvador delegation brought home a refreshing story of solidarity and mutual love between people who spend most of their time in different parts of the world. Read NYU student Sojourner Travis' reflection -- taken from our El Salvador delegation's blog -- about stepping into the experience of different people, and accompanying and loving one another. "Given the intensive nature of this trip, it could take forever for me to remember everything we did and the meaning of each activity. So, for our final blog post, I figured that I should reflect on the significance of what has been a theme in most of the revelations I have had here since the moment I arrived at La Casa Concordia: community. The people I met and the friends I made here have been the most valuable part of my trip to El Salvador. Realizing that my time here, for now, is almost over, I struggled to hold back tears last night here at Las Magnolias during Guillermo Cuéllar. What moves me is not only the bonds I have created or the fact that I have been made to feel like a member of the communities we engaged with rather than a visitor, but also the fact that the issues here are now personal. To me, it is no longer strangers, populations, or statistics being affected by the conditions and violence here. It is my family and my friends. To return to New York and forget what I saw and heard here and to continue life as if this week never happened is not only to waste an incredible experience but also to abandon those to whom I have grown so close. That is not to say that I now have to make it my mission to save El Salvador. In fact, I do not believe that it is my place to believe that I can or should do that. However, it is to say that the people I have met here will never live in exile from my heart or my thoughts. That is also to say that I will do my part to help my friends here whether it be through spreading awareness, even if just by word of mouth, to fundraising for projects here like La Casa Esperanza—a day shelter in San Salvador—or supporting Salvadorian entrepreneurs and artists. Whatever I do when I get back, I will do out of love, not guilt or pity, because those are not and should not be my takeaways from this experience. The issue with guilt and pity is that they create and perpetuate a false sense of inequality from which a slew of other problems can and will stem. Avoiding those things on trips like this one is incredibly important. We do not come here to feel better about ourselves, but rather to help both our friends and ourselves. The fact that this, along with the growth and strengthening of bonds, was the focus of the trip is one of the many things that impressed me about it. Among the others was the planning: Julie must have spent an incredible amount of time and effort in order to so successfully create a diverse view of El Salvador for us. I am honestly amazed by her care, knowledge, and dedication and would like to thank her for putting this wonderful and educational trip together. I would also like to thank the people at La Casa Concordia for all their hard work cooking and cleaning and making us feel at home in whatever way possible; Wilbur and Ulises for driving us from place to place; the people in Calderitas for welcoming us with open arms and allowing us to be a part of their community; Christián and Aldo for showing us delicious places to eat, hosting us at their guest house and organizing a private performance for us by Guillermo Cuéllar; all the people, families and communities that so graciously welcomed and supported us and Advent for giving me a scholarship to come here. With watery eyes and a heavy heart I must say goodbye, but I am very excited to say 'see you soon, El Salvador.' "
Can we model the inspiring hospitality of these El Salvadorian hosts, making newcomers to our community quickly feel like members of our family? What can we learn and apply from these insights shared by Sojourner? The challenges facing us in New York City and the United States are not exactly the same as those facing El Salvadorians, but our mission as God's people is the same. How can we be more of a community as a congregation, a city, a church, a country? How can we welcome all people into community with equal acceptance, support, and love, as God has already done? These are the difficult questions we must wrestle with, respond to, and act on as a congregation. Do you have a thought, idea, article, or video you'd like to share in response to these questions? 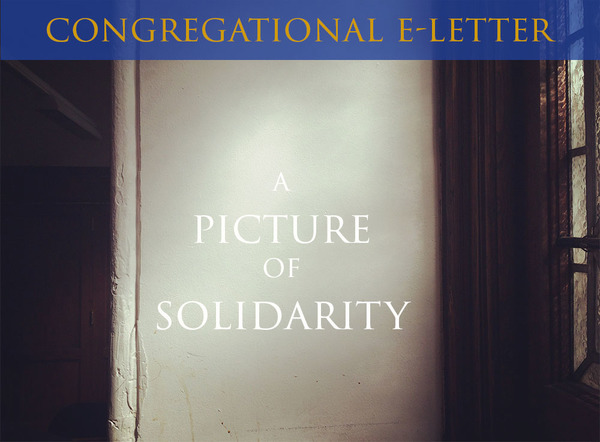 Let us know so we can share it with others in the congregation, and keep this important conversation going. Also, be sure check out the rest of the stories and reflections from our El Salvador delegation's trip in their daily blog. Finally, you can support our El Salvador ministry as our Mission of the Month. Dinner, worship, Bible study. Join us for three remaining Wednesday evenings of intergenerational and bilingual dinner, worship, and Bible study at Summer Suppers on July 27, August 3, and August 10. We are having a blast with great music, skits, food, and activities. Learn more. Peaceful, contemplative service. Would you consider joining our Altar Guild? All you do is setup our altar for worship on the occasional Sunday. Our Altar Guild members love doing it! Even better, you can learn how easy and rewarding it is before committing to join. Catch the next sermon in our Summer Preaching Series. Our summer preaching series on the Old Testament salvation stories continues this Sunday with a sermon on Jonah and the Whale preached by Pastor Sudbrock. Watch previous sermons on our YouTube channel. Adult Conversation | Meets at 10:10am in the basement fellowship hall. Pastor Sudbrock will lead a discussion about the day's readings.